Facilitator Summer School 2016..."The Crop Circles Speak"
Yesterday I felt to prepare energetically for the gathering and so went into meditation to feel how best to lay the 'foundation'. It didn't take long for the image of a white horse to come into mind. I knew immediately what it was referring to - one of the ancient white horses cut into limestone not far from Avalon in the very spiritual locality of Avebury - a place reknown the world over for the very mystical appearance of crop circles at this time of year. 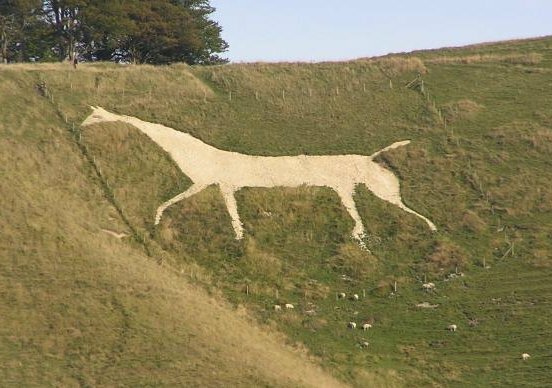 This particular White Horse has been a favoured wild-camping location of mine for some years, it's high elevation providing stunning views out across the Wiltshire countryside. But would there be a crop circle nearby? This is what I wondered as I headed out in that direction yesterday. My first port of call however was not that particular ridge itself, but rather an intriguing crop circle exhibition in the nearby town of Marlborough. Here you can see their website, containing many wonderful aerial photos...Crop Circle Exhibition UK When I arrived, there was a lovely synchronicity - a local organisation was holding a 'summer school' in Marlborough and from where I entered the town, the sign seemed to point directly to the church - to the crop circle exhibition. I simply knew in my heart this was a message meant for our Facilitator Summer School! 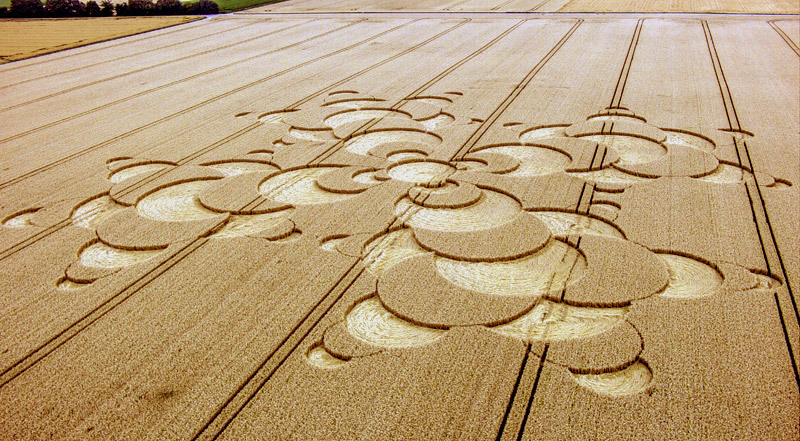 Why are crop circles so special? If you've ever been to one, and you're remotely connected into the surrounding energy field, you simply can't fail to be astonished by them. Firstly their stunning geometric patterns contain the most moving metaphoric messages for those with open minds and hearts. The technology is simply breath-taking - the crops have been 'pressed' downward into intricate interrelating patterns of the most incredible sophistication. Energetically, they are off the scale: standing in one (when they're authentic that is), can have the most magical opening, healing and realigning effect on your energy field. These are most definitely, without question, a means by which higher consciousness is speaking to us. Some of course have tried to ridicule them (they actually only end up ridiculing themselves). There's no way they (the authentic ones) are created by some 'army of new ageies', sneaking quietly out in the middle of the night and carefully folding over the crops! First of all, when they appear, they are practically instantaneous. There are no tracks leading into them, and most are on such a gigantic scale, it would be nigh on impossible to plot the intricate shapes so accurately without being done from an elevated position. There's no doubt in my mind, these are the work of highly sophisticated beings working interdimensionally through the field. 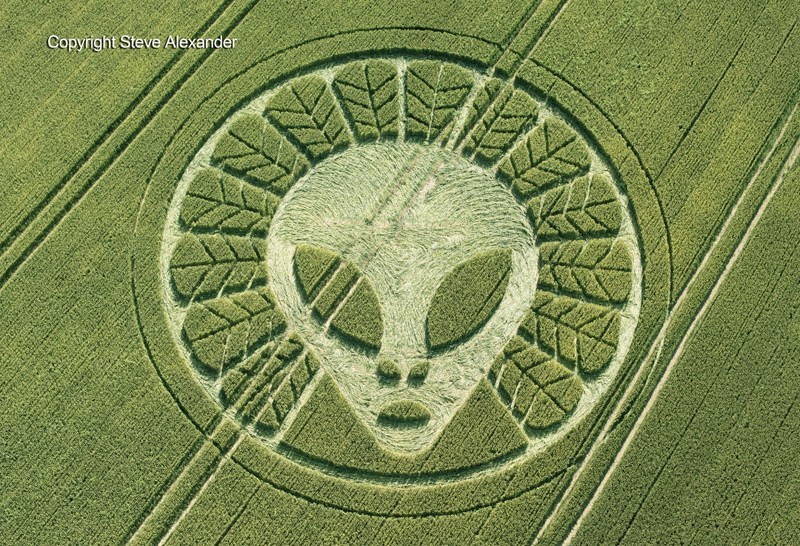 At the Crop Circle Exhibition UK, I met a lovely lady called "Silver". 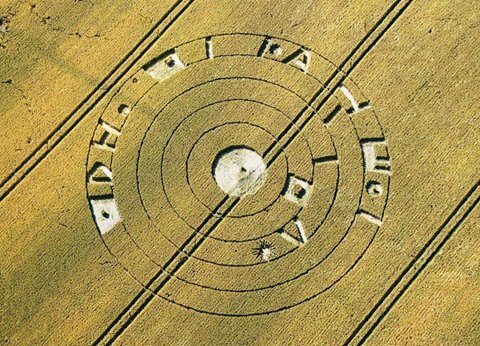 My heart was literally pounding when she told me that.... "a crop circle has appeared the previous evening, not far away, which can clearly be seen from the ridge with the White Horse". Wow! Thanking her profusely, and taking swiftly off in that direction, I just knew there would be a particular message in it for me, and for the commencement of the facilitator gathering - how blessed! I made it to the ridge about an hour later, and there it was, a stunning crop circle way off in the distance. I could clearly make out the interrelating geometric triangles and pentagons - 3 and 5 sided shapes. I already had a sense of what they might be referring to, however, I just knew, that no matter how difficult the journey, I had to stand in the centre and feel the energy - especially with it being so fresh. So I marked the location in mind and heart, and took off via a circuitous route across the fields, eventually finding the circle some while later. Picking my way very carefully through the undisturbed field, leaving behind me any low energy paraphenalia such as phone and wallet, I eventually found myself in the circle itself. I can't tell you how tremendous it felt to be there. Not another soul was around, which heightened the sense of peace and expansiveness. Interrelated Sacred Geometry - "connecting the fragments"
It was clear to me the interrelated 3 and 5 sided shapes were of special significance. But having no aerial perspective at that stage, I couldn't immediately know what it was telling me. Although standing in the centre, I could most definitely feel both a counterclockwise ascending energy spiral, and a descending clockwise one. And most marked of all, was the fantastic sense of expansion in the third eye. So the message for the facilitator work, is all about connecting broken, disconnected fragments of light in the 3D, harnessing and channeling them together, that they may reunite in the Fifth Density. It's work that can be done both within an individual and at a collective level. Today, as the Summer School begins, I'm still pinching myself in awe, excitement and astonishment. What a great way to begin the week. Tune in and join us. The energy is sure to speak to you profoundly, where space and time are no limitation! The first thing that struck me is the alchemical relevance of the stars. "In alchemical symbolism the five points signify the interconnection of the four elements (Air, Fire, Water, and Earth) united by the fifth element or "quintessence" that is sometimes called Aether and more often Spirit." The five pointed star also represents wholeness: a symbol of divine perfection, the complete union of the opposites. Wow! 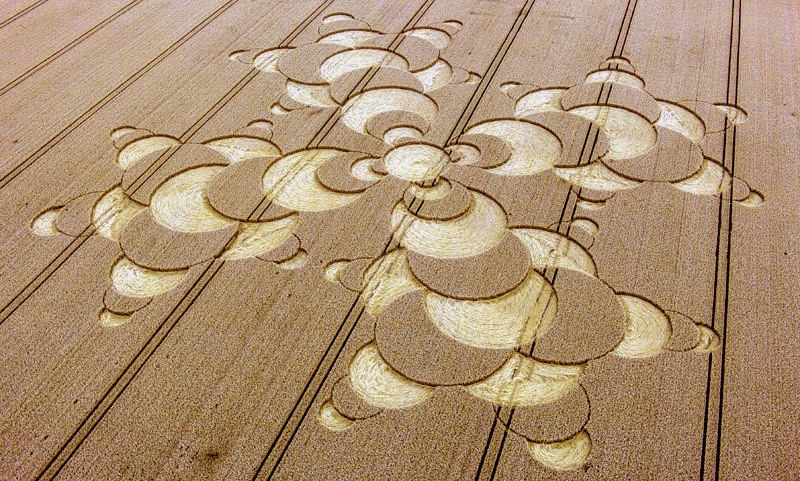 Incredible crop circle. I'm making lots of connections looking at it. When I stand back and take an aerial view, I count six 5-pointed stars inside the One 5-pointed star. This equates to seven stars, which correspond to the seven chakras of the bodymind from crown to base. Number One in the Voyager Tarot is The Magician, zero spirit transformed into physical form. As magicians, shamans, and sorcerers living in the third density, we have the power (magh = power) to transcend the pain of separation and embrace the unity of both duality and Oneness as the unique sparks of the Divine we are. In the Voyager Tarot, the Star XVII symbolizes the law of luminosity. We are starlight, brilliant sparks of the divine, here to fully infuse the light of our souls through our bodyminds and reintegrate all the lost soul fragments we see inside the crop circle -- the karmic experiences we've identified with. When we light up like the stars we are, we help others find their starlight. Number five in the Voyager Tarot is the Hierophant, who symbolizes the law of life-mastery and an awareness that every experience is the perfect opportunity we need to self-realize and remember who we truly are, the One Absolute Presence in all experiences, identified with none. Number 7 in the Voyager Tarot is The Chariot, symbolized by the Greek Charioteer, representing the law of motion. "To be moving is to be alive." We're on a cosmic journey to break through our fear and ascend to the Fifth Dimension of unconditional love, compassion, and respect for all sentient life. What is there but divine service? - finally, guidance on how best to approach the path of divine service going forward. Everyone opened up incredibly quickly. Divine service to others is always about peeling away blockages and veils inside ourselves. As we do that, our life situation truly advances, the path of light opens up, miracles and magic abound. New possibilities within a new narrative unfold. That's essentially what this week will all be about. I invite you all to explore with us. Afterall, what is there but divine service? What is Spiritual Facilitation all about?...the "SEER"
So what is Openhand Spiritual Facilitation all about? Yesterday we were working with the unique Openhand Facilitation process called "SEER". That's what the facilitators are essentially training in. Here's a brief insight, bearing in mind that although it appears simple, it is not at all easy. The "S" stands for Set-up and Situation: facilitators establish an energetic space - a field of clear consciousness - in which to work. This has many considerations including reducing clutter and electromagnetic smog. It's about opening a bridge into higher dimensions, connecting with benevolent forces to work with you. Then it's about embracing the client in this space - embracing them within your own field. This in itself begins to resonate authentic beingness and activate subconscious blockages such as karma. Within this protective and energetically nurturing space, the facilitator will then ascertain from the client what they feel the session is meant to be about - bearing in mind, this can change through the initial meditation itself. The first "E" stands for Exploration and Entrainment: through the use of skillful intuitive questioning, the facilitator helps the client explore their situation - what is arising in their life as challenging and to be worked with? The facilitator is trained to look for 'spiking' words that naturally emerge - words that spike in the field. For example: worthlessness, loneliness, fear, worry, sense of lack, neediness, responsibility or obligation. The approach is to then 'entrain' to this energy. Which means to give attention to it and activate what's underlying it - the karmic source pain which limits people's reality and creates the circumstances of their lives. The second "E" stands for Expression and Empowerment: the facilitator encourages the client to express outwards the feeling of the source pain that their touching - that which is subverting their life situation. By fully expressing this pain, means you can become as-One with it. Instead of rejecting it and creating inner polarity (which is the cause of suffering), we completely embrace the pain by honouring it. There comes a crucial point where you - as the One - can then step through the pain and into presence. Here comes the empowerment part - because as presence you don't need the pain to go away. You can totally accept it. Here's the beauty of it - in that place, you reintegrate lost fragments of soul that were holding in place that eddy current of pain. The pain has no more anchor in consciousness. Upon which, you can work with the infusing soul to wash the pain away. The karma disappears! Instead of being disempowered by subconscious limitation, now the soul is empowered and the client can authentically create an entirely new narrative in their lives. It happens effortlessly as an arising flow through them. It's literally breath-taking to behold! it's a bit sad that I couldn't join you in person this time, but that's just how it is. I am sure you are all having a fantastic time! Just wanted to let you know that I am tuning in from home and I got a nice and fresh Cropcircle formation for you to enjoy. It's from just two days ago and appeared in Munich and certainly is a beauty. How great to hear from you Oliver - it's nice to feel you here. 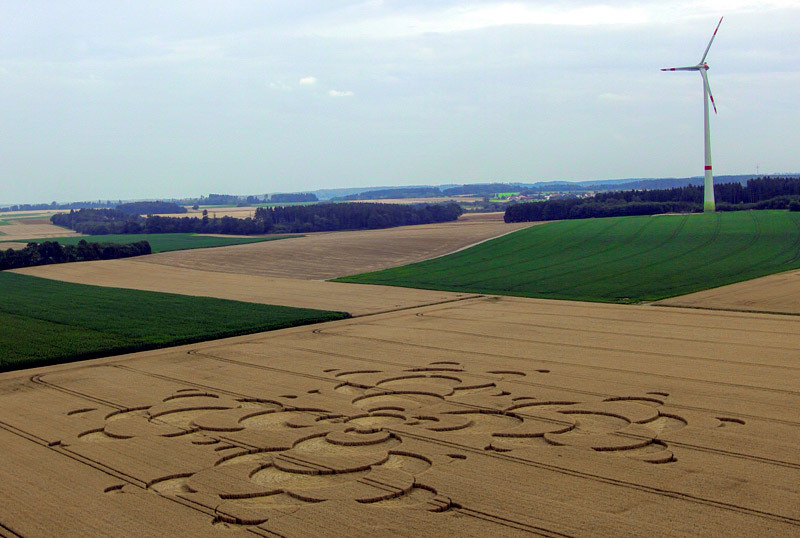 And thanks so much for sharing the crop circle imagery - spectacular! Yesterday on the Facilitator Summer School we had a powerful sequence of experiences working earth energy grids and unleashing multidimensional energy portals. What is this about and why is it necessary? Imagine a central column of light, ascending through the dimensions into the Fifth Density. And that this column is now strengthening all the time. Yet fragments of light are still 'detached' and dissipated into the 3D densities. This creates a dangerous and unstable polarity. As the main stream of the flow strengthens, it creates enormous potential energy difference between the flow and the dissipated fragments of light. At some point, if the energy is not released, integrated and harnessed, then the situation becomes literally explosive, as has happened in other Ascension situations as on Sirius 120 million years ago - which many are living with the karma of here today. There are plenty of energy workers amongst us who have the inherent capacity to activate these dissonant, disconnected light fragments and channel them back to the main flow - by working the energy inside themselves. All that's often required on the facilitator program is a reminder - a reflection - on how to work this way. Sometimes facilitators simply require a confidence boost to affirm what they've long known within their own capabilities. So the group had a powerful day working with the earth grid, unblocking and releasing pent up energy. Another aspect was working to undo intentional convolutions - 'black magic - by Opposing Consciousness, designed purposefully to retard the integration and Ascension energies. We worked to feel these convolutions and allowed them to dissipate through us. It's about taking the convolutions inside your own field, then applying ray 1 will to unravel them - like unraveling knots. And finally, we used sound to unleash multidimensional energy portals which support the Ascension that other sentient life might benefit from. These are often spirals of energy, which run counter-clockwise in the ascendance. It was a wonderful day indeed, much learned and gained, much synchronistic, supportive energetic feedback from the universe. We were truly blessed! 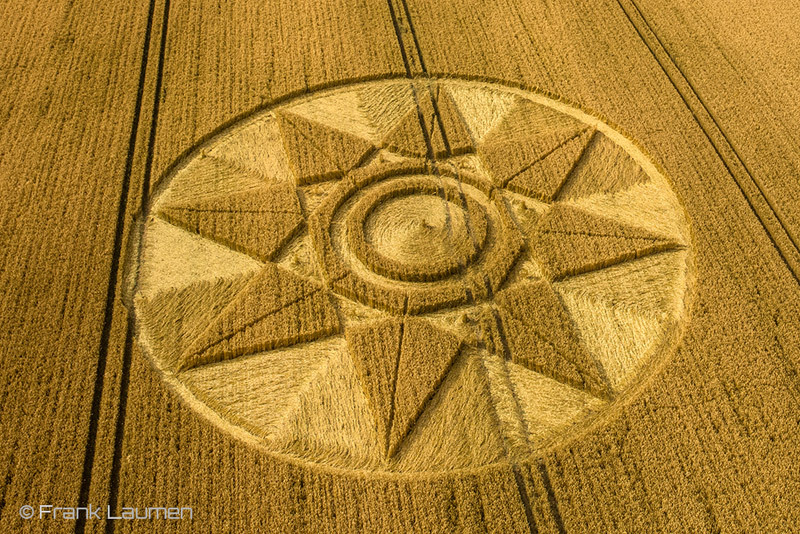 Open, when you first posted this photo of the crop circle and invited us to share what we saw/felt from the photo I had a deep reaction of energy being stuck/confined and I wanted to open one of the hexagon sides to let the energy flow in...and out. 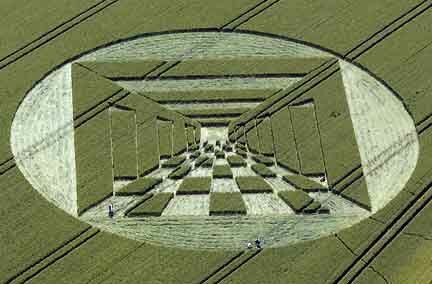 I was uncomfortable looking at that crop circle because it felt like a prison. I was drawn to the little circles below each indentation of the hexagon, wanting to help them flow into and out of the stars and triangles. Like little fish in a coral reef. I did not understand these feelings I was getting from this crop circle. After reading your explanation of fragments and the polarities, I now understand what I was feeling. Thank you! I find a strong pull to this page today. I listened to this as I read from top to bottom (https://www.youtube.com/watch?v=7TO_oHxuk6c). I felt like one of these fragments of light that Open talked about, just existing in this world seemly all alone. As I started to read each of your feelings, I found myself, let say, riding on your backs to a brighter light. Being here made me feel like a puzzle piece. 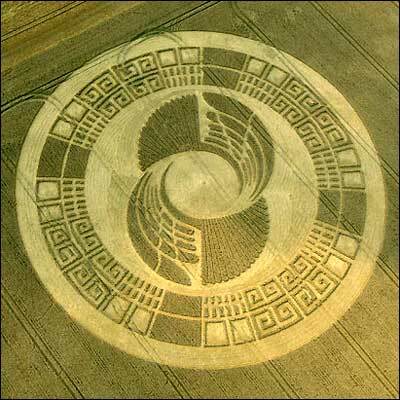 Not knowing where I belong , but truly feeling that I am a part of the bigger picture like these beautiful crop circles.Are these circles a gateway, a portal, or a meeting place for lost fragments of light to shine brighter to guide the rest of the fragments home? At one point I felt quite emotional, I stopped and looked inside to see where this was coming from. For a moment I found myself sitting in the dark, outside a door. This door was full of cracks with light shining through. The dark was what was behind me,the door to me represents acceptance and the light beyond the door is the bigger picture.This bigger picture to me maybe where I believe I am being pulled. From here it looks like where all light fragments come from. Or is it where, once you get there you can see that this is the place that lost fragments like myself come together to travel the rest of the journey to the 5D shift. I feel truly blessed to be a light fragment on a journey to where, I do not know. The energy I feel when I visit Openhand's site or join the openhanders in the ether is to me the way through the darkness. All this reminds me of the icosahedral model of human body displaying a continuous tension and floating compression. People who practice martial arts know that to get the maximum energy you tap into the core and then explode with tremendous force from within. Pulling the force from deep inside your available structures is recruiting the entire body mass, all connected “fragments”, the continuity of the form. For example, you will not be able to throw a ball very far if your hip or hamstrings are dissociated (unavailable). You will also be able to dissipate a blow much easier if you embody your whole system. Literally all “parts” of the system are important supplying different dynamics to the whole. The more "parts" are involved, the greater the capacity to store and release the energy through the entire system. (I put the word "parts" in quotation marks, because there is no such thing; it's just a useful reference.). So, our physical bodies are like Mobius strips, without beginning and without the end, expressing health and vitality as continuity and dis-ease through fragmentation and dissociation. I see each of us is a reflection of a greater structure of the collective consciousness, a fractal construct spiraling out, constantly changing. The more structure consciousness we have within our body, the more energy can be stored and released from it. I think the same applies to the global consciousness. So, whatever we realign, will affect the dynamics of the whole. That’s why I have tremendous amount of gratitude and respect for the work you all are doing now at the Facilitators Summer School. I thank you for helping us all to find the connection to the Source. Today I'm feeling anger and rage in the collective consciousness and in my own psyche. The image I'm given is the pressure cooker my mother used. I can see the steam escaping and whistling through the portals as the top of the pot rattled and rocked on the stove. I was always fearful when she used her pressure cooker because of her cautionary tale about explosions that happened when the steam built up too much. Note to self. There is such rampant social inequity and oppression of sentient life here in 3D that continues to escalate. Will it come to a head and explode like it did on Sirius millions of years ago in the white dwarf ascension? I woke up at 3:00 a.m. last night as I often do at this time. I felt intense fear in my solar plexus area. Butterflies were flying riotously in my stomach. I did deep, yogic breathing to calm myself, which helped, but I couldn't get back to sleep. Today I feel exhausted and depleted. I pulled the Four of Cups/Anger Voyager tarot card this morning, an apt reflection of how I'm feeling and also an indicator of the emotions I have repressed related to karmic experiences down through the eons. I'm feeling overwhelmed at the deep layers, both individually and collectively, that call out to be processed and released. I am summoning up my Ray 1 warrior energy as best as I can to stay the path of letting go. I hear and resonate with Open's comments about the dangerous disparity between the polarized, distorted energies energies here in 3D hell and the aligned, harmonious energies that are strengthening in 5D. And his call for energy workers to harness and transmute these stuck energies. Like Tigger, my attention was initially drawn to the portal holes at equidistant points around the 6-sided hexagon. Number 6 in Voyager tarot is the Lovers, representing the union and integration of polarized energies. I'm envisioning the steam whistling through these portals so all hell doesn't break loose. The best I can do is open and clear my own chakra energy portals as best as I can. Thanks for your comments and for sharing your experiences, Katie. I guess we were both singing "Wide Awake" along with Bono in the middle of the night! Breath, trust, and the natural elements, yes. Thanks for that. Trust is a big one for me. A few easy going days would be most welcomed. It's been pretty intense. It was a big, big day yesterday. Much, much energy work leaving everyone fulfilled but shattered! We worked on one or two dark sites used to try to 'command' the area and bringing in various spurious interdimensional energies. We worked to reverse the polarities, which felt pretty successful. I don't feel to go into too much detail. Except to say I recall talking to a group at the site a while ago, explaining it as an intentional site of the "Black Snake". At which point, a black snake ran over my foot! We worked to clear it. Enough said. Either way, it promises to be a big day for us all. Do tune in and join us. See what you feel. Gratitude for the sharings and energy work. Not in a good place at mo, really feeling dense 3d gunk and woke just not quite knowing what to do with myself. Tuned in and felt pull to connect with thread. Echo Horse in that connecting with openhand is a way through the darkness. I don't feel any better but my soul does! 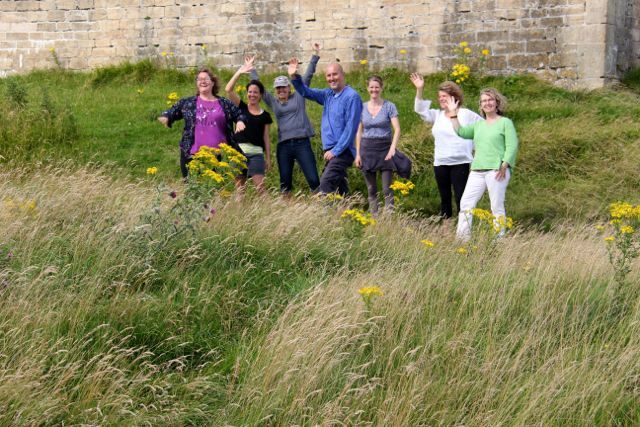 I have such an affinity with silbury hill so interested to hear more. I've always felt the battle of polarity there but underneath it, where the connection with Gaia is pure I feel an immense beautiful strong feminine power. Am awaiting the day the lid is blown off the hill. Thank you all as I can now feel the connection once again in the midst of this sadness. I feel strongly to break free from shackles that I can't even see but do feel are visually represented in the first crop circle near the white horse. Thank you . Love from here. Beautiful magnificent experiences, I've often thought about the collective energy of like "people" moving through the physical plane and how the dialogue with the Universe would speak!! I felt I was urged to share as I had made up my mind to just enjoy all the sharings without posting but I felt urged to share! At work last evening, I was in my office and looked down. What do I see? 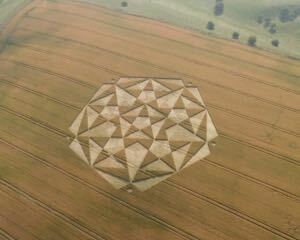 But a triangle looking like it fell from a crop circle. It was actually a triangular black protective edge that had fallen free from it's intended position! I couldn't stop looking at it or smiling. Also, my eyes were pulled to the four sided shapes which looked like an elongated rhombus and brought to mind crystals. I saw the 4th dimensional energy of a crystal connecting the third and fifth dimensions. Purity and lightness then I felt movement of energy pulsating, swirling, spiraling through. Happy exploring! Thanks for inviting us along on your voyage. I have to say, setting out yesterday, I felt pretty exposed. I don't broadcast this kind of work, especially not in advance, for reasons that will become clear. But I also recognise the importance of you all connecting into this energy space, so I felt to take the chance. The day began in thick, billowing grey rain clouds, deluging most of the area and looking like they might place a serious dampner on the day. But I also knew that they were chem trail initiated, and that they probably wouldn't last - that we might find a space to wait them out. My suspicions that the expedition might draw interference were confirmed a little way from our first destination of Marlborough as a car swerved dangerously in front of us with the number plate 666 ET! Upon arriving in the town, one of our cars packed up, and may well have to be scrapped. Nevertheless, Fiona, the owner was blessed, she'd been feeling to get rid of the car (metaphorically representing an old bodily vehicle) and we managed to get it to a garage in the town where it finally conked out. Fiona dealt with it wonderfully - absolutely total acceptance and realisation of what it meant. It did mean that she and Pennie wouldn't be able to join us for the rest of the day, but they accepted it with grace, and consequently, had their own wonderful day in a different, but very magical, way. For the rest of the group, we certainly weren't going to be deterred by the initial set-back. We found a welcoming coffee shop to wait out the storms. Whereupon there was a catalogue of signs and synchronicities speaking to us during our 'holding pattern'. A clear depiction of a fair old ding dong battle between benevolence and the underhand forces. Never go to the obvious place. That may provide an initial pointer, a place to begin from, but the end goal will always be unexpected. That way you keep those stuck in manipulation and control off your back. They can't deal with the spontaneity and flexibility. It's always a great unraveller! I did very much get the feeling that work at the longbarrow connected an energy field that can remove these implants. We all certainly had a great experience there - a realigning and centering one. Certainly a couple of the group felt implants being removed. But as I said, that was only the beginning part of the mission, and a merry old journey followed, leading finally to another site, which I feel not to disclose. It was steeped in synchronicity, revealing the requirement to help establish a Pleiadean energy centre. Interdimensional technology had already been placed. I am not given to share the form, but I can tell you it consisted of golden light. We were given to work with it and establish the connecting bridge between 'heaven and earth'. Pleiadean energy is of course highly relevant to battered and botched DNA. 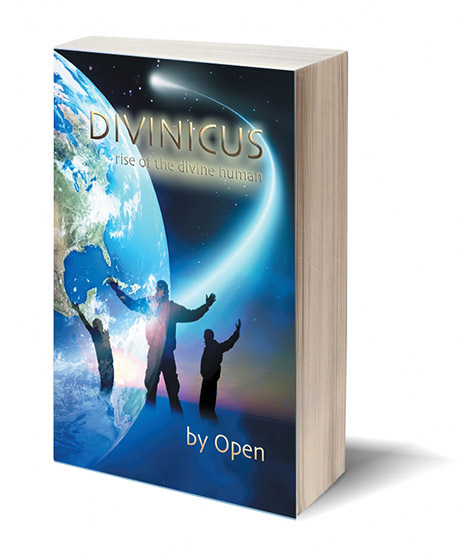 As I've explained briefly here in Go Beyond, and much more fully in my book DIVINICUS, Original Human DNA, which ascended humanity from the apes, was seeded by, and from, the Pleiadeans - sanctioned by the highest levels of benevolence because the soul of man's originator was yearning for more evolved evolutionary expression. And it was to help overcome the intervention on Earth, which was already in full swing. Humanity offers the potential to ground higher consciousness right down to the earth. Again, I've explained this dynamic in DIVINICUS. The work we completed was tremendously fulfilling and rewarding for all. Tuning in through the ether, you may well get the sense of that Pleiadean energy being grounded in that location. Tune in and see what you get - bearing in mind the area is also beset with various distorting convolutions. On the way back from our expedition, spirits were high, music and song flowed, greatly bouyed by the latest delectable on-the-road picnic creations from Trinity - I'm so often reminded 'an army marches on its stomach! Yes indeed! And where are so many of those Pleiadeans now hanging out? The East Coast of Australia. You simply couldn't write this kind of thing! Kickass warriors! All of you! The golden light of the Pleiadean energy center emanates far and wide. Ah, how uplifting and powerful your last day's account feels! Holy smokes! It reads like an adventure story and it made me hold my breath several times. The veil is so thin these days, isn't it? The separation between the illusion and reality seems to be more tangible too. I love it how you proceeded with determination, trusting the path that was literally being woven in front of your eyes. I imagine it must have felt so special to feel into signs and synchronicities as a group. Sharing a reality makes it so much stronger. A big THANK YOU, O-Team! Thank you so much for your exciting sharing. It's just out of this world! a real pleisure to read some of the energy work u all did . I truly felt sad not being able to join in flesh , but i did my best to connect through the ether . I am not sure about what was going on in the field last week - i surely felt like there was very heavy energies been moved and broken down in the field . I was fully in a tough floor painting work last week , feeling pretty unusually shattered physically and mentally - like if the old vehicle was starting to fall apart ( metaphorically ). Every sign of synchronicity appearing were connected to the work u did over there ( number 3 & 5 most of the time and a piece of leather in the form of an O ) . The course was an absolutely amazing experience. Working together, honoring and appreciating each persons unique gifts and exploring how to come into those more fully and unleash them into the world. It made me dig deeper into myself, my own sense of feeling as well as bringing a greater understanding of the wider field. Much love and gratitude to you all!!! The journey to Glastonbury was full of flow and messages from the moment I set off, I could feel the energies bubbling. And so it was, a week full of flow, learning, blessings and beautiful connections, like minded souls, each with unique gifts, offering mirrors, support and inspiration throughout. The feeling of being held in a nurturing space from which unfolding and expansion simply arose. Guidance and energy being resonated awakening connections with new forgotten energies, guides and higher dimensions, strengthening awareness and sensitivity. The journey feels humble yet immensely powerful. I am still integrating; many learnings on many levels, it is difficult to land it all intellectually. And so with a deep breath, connecting at the level where all is already within and can be drawn on, I feel the shift in truth. Sychronicities and flow continue. On the journey home I passed two beautiful big white horses, which took my breath away and then drove through two white gates, one on either side of the road, representing for me, the connection with higher dimensions. And today blue rubbish bags, blue wheelie bins and a man wearing blue collecting them called C. Oils, speaking to me of the Pleiadian connection coming through, helping working with the energies. Magical. Kim & Michelle - thanks so much for the lovely feedback. It was awesome having you along. I'm struggling for words here. A week. Only a week? Increasing flow and pools of magic, all sorts. What a privilege to be in the story, in the flow, with The Team, it was. With my guides and ancestors and ours, and the future ones. Google maps, yes, really everything is encompassed in the flow!- it just has to be out of resonant spontaneity. I found myself.......I was going to write, 'here' and post a photo but I can't make it work so I'll have to tell you with words. Craggy cliff, history strewn destination I had thought was coming. It was absolutely silent, empty, spacious and huge. In every direction. For a long time. Since? Last night was the first I slept peacefully, so much to integrate. Were pink roses. And the feeling and smell of the pink roses was expansive, light, open, subtle, radiant. Later as we approached the barrow, across the wheat field there were swifts wheeling inn the air above and in front of us. Such a fleeing of movement and sheer joy in their beingness. Everything moving. Bright, clear, nothing dense, nothing fixed. And this gift, this feeling was what I needed when I approached the density, as we felt the weight taking our attention as we climbed the hill to the last location - a weight more than my love handles and muffin top, more than these bones. Then that none of it is me. And how none of what I have written above needs to become 'a thing', it's just a landing and then there will be a taking off again and more movement. But, for sure, I was given gifts and this is what I was born for. And now how to be with it all. Hi All - I feel a deep gratitude for everything we shared last week (and in the last few days as I was able to stay on at Avalon Rising a few extra days). Such unique gifts and ways of expressing. Our journey opened my eyes to a much greater potential to feel and work with energy...a completely magical and new experience for me. Our jam session was over the top - I felt such community and the liberation that comes from dropping all the pretense and just being you, trusting that is enough...even if it comes out jumbled or off tune - it doesn't matter. It was so special to me to feel that non-judgement and feel that drop in as a gift, a powerful mirror and key to my own journey...one that I feel is essential to integrate at this time on a very real level. Layers and layers of stuff has been exposed within...deeply hidden patterns that have cut a pretty strong groove...I come away from our time shared feeling a bit raw, but also inspired to rise out of these grooves - open my heart to the beauty, the connection, the light.